Story: It is the ultimate cold case. The rampage of a madman who has never been caught; the elusive cipher slayer who gripped the nation in fear, America's very own Jack the Ripper. He publicly claimed 13 victims, then more, two dozen more. Police pinned him with seven, five dead. The true body count may never be known. One thing is certain: That count includes the living. 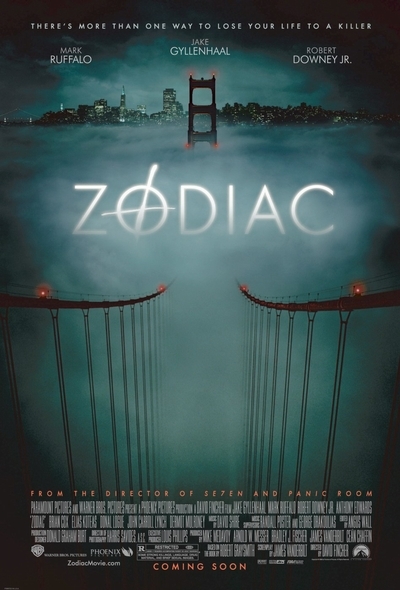 Based on the true story of a serial killer who terrified the San Francisco Bay Area and taunted authorities in four jurisdictions with his ciphers and letters for decades, "Zodiac" is a thriller from David Fincher, director of "Se7en" and "Fight Club." Hunting down the hunter would become an obsession for four men, an obsession that would turn them into ghosts of their former selves, their lives built and destroyed by the killer's endless trail of clues. Of the four, Robert Graysmith (Jake Gyllenhaal) was the wild card. A shy editorial cartoonist, Graysmith didn't have the cache and expertise of his seasoned and cynical colleague Paul Avery (Robert Downey Jr.), the San Francisco Chronicle's star crime reporter. He didn't have Avery's connections with San Francisco Police Department's celebrated and ambitious Homicide Inspector Dave Toschi (Mark Ruffalo) and his low-key, meticulous partner Inspector William Armstrong (Anthony Edwards). What he did have was a crucial insight no one anticipated. It first appeared Aug. 1, 1969. A crudely written Letter to the Editor arrived in the day's pile of mail. One of three penned to the Chronicle, the San Francisco Examiner and the Vallejo Times-Herald, its contents brought the newsrooms to a standstill. "Dear Editor, This is the murderer..." of David Faraday and Betty Lou Jensen shot to death Dec. 20, 1968 on Lake Herman Road in Solano County and the July 4, 1969 fatal shooting of Darlene Ferrin and attempted murder of Mike Mageau at the Blue Rock Springs golf course parking lot in Vallejo. He didn't call them by name, but he gave a laundry list of details only the police could know. Each paper was given part of a cipher which, when decoded, would purportedly reveal his identity. It was followed by a threat - publish or more would perish. No killer since Jack the Ripper had written the press and taunted the police with clues to his identity. Zodiac had raised the bar for homicidal psychopaths in the U.S. A Salinas couple decoded the message. But it was Graysmith, a cipher enthusiast, who decoded its hidden intent, a reference to the 1932 film "The Most Dangerous Game." More letters and threats would follow. On Sept. 27, 1969 Zodiac would strike again, hooded and armed with a gun and sheathed blade, he would stab to death Cecilia Ann Shepard and leave for dead Bryan Hartnell as the young couple picnicked at Lake Berryessa in Napa County. One month later, Oct. 11 the killer had come to San Francisco. Taxi driver Paul Lee Stine was shot in the back of the head in the posh Presidio Heights neighborhood. Three days later a fifth letter arrived, the most ominous of all: Zodiac told police they could have caught him that night. Worse, school children were in the cross hairs of his gun sight. He would pick them off as they stepped off the school bus. San Francisco was literally a city in panic. Zodiac inadvertently had turned detectives Toschi and Armstrong and reporter Avery into overnight celebrities. Characters based on Toschi would prove pivotal roles launching three movie stars' careers. Graysmith remained committed to his armchair sleuthing from the sidelines, injecting his input when Avery would allow. Zodiac was always one step ahead, covering his tracks, peppering his lettered taunts with more threats. And then they became personal. Infamy would eclipse fame as Toschi fell from grace; Armstrong, frustrated moved on; Avery left the paper, crippled by his addictions. Zodiac would no longer reveal his targets. Copycats sprang up coast to coast. The key suspect was still out there. Graysmith's moment had come. That moment would change their lives forever.